Entire family: Yes, but . . .
South Seas. Romance. 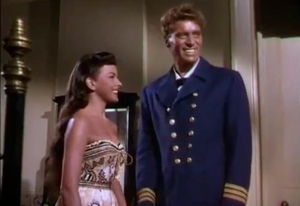 Those words are almost synonymous, and in His Majesty O’Keefe, a 1954 semi-swashbuckler starring the acrobatic Burt Lancaster, all the color of the islands bursts onto the screen. Narrated in voiceover by the main character, a 19th-century Yankee sea captain who is determined to get his share of the lucrative copra (dried coconut) market, His Majesty O’Keefe will remind literature students a little bit of Conrad’s Lord Jim or Melville’s heroes from Typee or Omoo. It’s the story of an adventurer’s exploits in an exotic land where beautiful native girls are as plentiful as the islands’ other resources, and dangers lurk not with the elements, but with potentially hostile indigenous people. In the ‘50s, or even a generation ago, that would have been enough to hold the interest of most families. After all, here was a chance to see Fiji (it was filmed mostly on the island of Vitu Levu), and producer Harold Hecht and director Byron Haskin featured real islanders in the film. But today’s families can just go to Google Earth if they want to see Fiji, and they’re so used to seeing violence and dazzling special effects in action movies that the clashes in this film will seem not-so-adventurous—especially the one-on-one fights where punches that look like glancing blows send a man toppling in a series of backward somersaults. His Majesty O’Keefe has an old-fashioned movie vibe, and the “native” dress and dances suggest more than a touch of Hollywood. So how your family will respond to this depends on how they respond to old-time Hollywood films. Based on a true story, His Majesty O’Keefe follows O’Keefe as he partners with a Chinese dentist and sails off in an antique Chinese pirate ship with the goal of getting the natives of Yap to harvest the copra for him—something a German trader on the island was incapable of doing. On Yap he draws the eye of one local girl, but when he and his men put into shore at another island after he’s wounded in a tribal attack he meets another young woman he intends to marry. When he learns that the Yap islanders make a perilous outrigger journey to a distant island to harvest stones that are used for money, he decides to take advantage of the situation. Aside from trying to trick and use the Yap islanders, O’Keefe is basically a good fellow, and that applies to his dealings with people, his keeping of promises, and his gentlemanly behavior with women. The violence is tame by today’s standards, and all’s well that ends well, so some families might actually prefer films like this to today’s supercharged action flicks. His Majesty O’Keefe was intended as a follow-up to Lancaster’s 1952 huge hit, The Crimson Pirate, but the pirate flick has more acrobatics, more humor, more rousing music, and a narrative that seems somehow more crisply paced. Still, O’Keefe is a better-than-average adventure film from Hollywood’s romantic era. It’s available from the Warner Bros. Archive Collection via movies-on-demand. If you’re interested in older movies from a more wholesome time, you might skim through their catalog.